Inspired from toxel’s post and designboom. Seeing all these shoes make me want to go shopping! First pair designed by Chau Her Lee. Shoe designed by Chau Har Lee, this shoe doesn't have an ordinary heel if you haven't noticed. 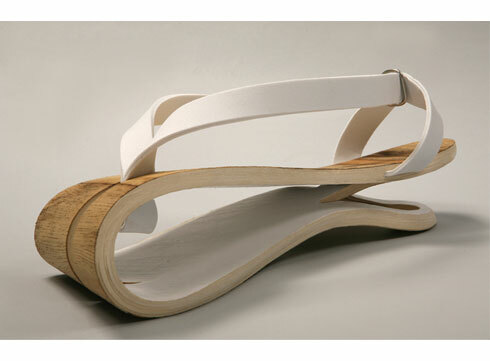 Sandals by Yarel Yair Design Studio. A wooden summer sandal, inspired by the Japanese sandal, with an innovative fresh look , made from natural materials, lightweight and airy. Made from wood, steel and leather. By Yarel Yair Design Studio. And now, the hoof shoe craze, started by Iris Shieferstein! Interesting point of view, and I don’t like how dead animals are used, but if you think about it, we all wear shoes made from leather all the time – taken from dead animals brutally. So I guess this isn’t that bad after all. By the way, Martin Margiela’s website is awesome and it’s NOT under construction! other hoof shoes by martin margiela, apparently, he has them for all seasons. And skeletal stilettos by dsquared2! I loved the entire series. 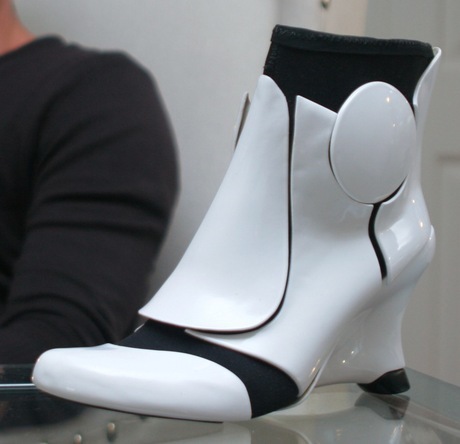 Aand, one of my favorites of all time, Liam Fahy‘s Stormtrooper stilettos, that won him the Fashion Fringe Shoe competition, bagging him a paid internship with Rupert Sanderson. Last but not least, an interesting interactive shoe that works through an iPhone app, “SHORT ++” (or robotic elevator shoes), created by Adi Marom. I am currently looking for internships for the summer, and it really proves harder than it looks like. I would be happy to send my resume to serious employees who are interested. The Istituto Europeo di Design accepts students in their last two years in various design categories for summer school. Check the offered courses/programs here.